This kit is especially designed and equipped for new hand to learn and do your DIY 4 colors screen printing. 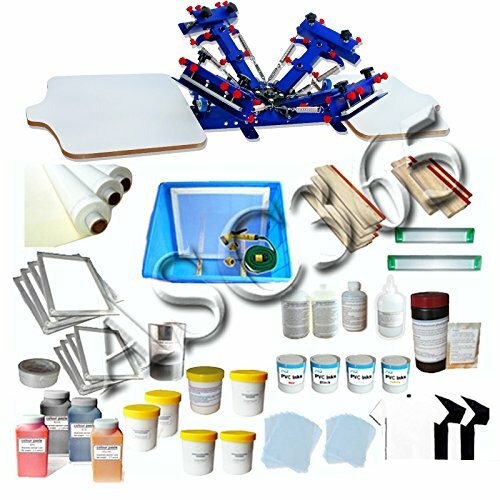 Except for the screen printing equipments, it nearly includes all the materials for doing 4 colors T-shirt screen printing; Another important thing is that we will also provide the full set of technical support. Table type and combinatorial design saves place and convenient for transportation. Pallet bracket could be moved back and forth within 3.14/15 "(10cm) Screen clamp can be moved up and down, which is suitable for screen frame within 3/4" (2cm) Big supporting device keeps the machine stable and in balance.